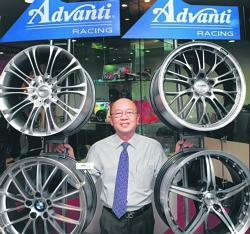 YHI International, a distributor of automotive and industrial products and an original design manufacturer (ODM) of alloy wheels, has posted a 1.4 per cent rise in net profit to $6.49 million in the second quarter ended June 30, 2008, from a year ago. Group turnover in the second quarter was $120.2 million, up 10.8 per cent. Earnings per share increased to 1.11 cents from 1.10 cents. Wheel and deal: Mr Tay said that sponsorship of alloy wheels for the Scuderia Toro Rosso F1 Team has strengthened YHI's branding. Turnover from its manufacturing business rose by 3.6 per cent to $40.7 million in the quarter. Turnover from the distribution business increased by 14.9 per cent to $79.5 million, primarily driven by stronger tyre sales. Gross profit increased by approximately 23.8 per cent to $30.9 million, attributable to higher sales volumes and better margins achieved in the distribution business. However, distribution and administrative expenses rose due to higher delivery charges, together with increased expenses incurred as a result of additional staff costs that arose in tandem with a rise in business volume. Finance expenses also increased primarily due to higher interest expenses incurred from bank borrowings to fund working capital. For the six months ended June 30, 2008, YHI's net profit rose 0.9 per cent to $11.7 million while turnover improved by 13.3 per cent to $231.8 million. YHI said that it has embarked on aggressive branding campaigns to enhance its pricing strategy and to strengthen global brand equity for its proprietary brand 'Advanti Racing' through the sponsorship of alloy wheels for the Scuderia Toro Rosso F1 Team. 'Since the sponsorship announcement in February this year, we have been able to command a higher selling price for our products. The sponsorship has helped to strengthen the group's branding and enhance recognition of the high quality of our products in the world market,' said Mr Tay. The company's shares last traded at 24.5 cents.